I recently replaced the 250gig HDD that came in my Macbook Pro with a new 500gig drive. I installed a fresh copy of OS X on the drive, and then restored all of my files from my Time Machine backup during the initial setup on the first boot. Everything went much smoother than I was expecting, but the process didn’t help me move my installation of Windows XP on my Boot Camp partition. I plugged my old 250gig system drive into an external USB enclosure and tried manually copying the Boot Camp installation into a blank Boot Camp partition on my new hard drive. I wasn’t expecting it to work, and it lived up to my expectations when it didn’t. My assumption is that there are issues with things like the Master Book Record that can’t be solved with a simple file copy. I did a web search and found a (free, donationware) utility called Winclone that was created for backing up Boot Camp partitions into image files, and then deploying those image files onto new machines. The application made an image file out of my original Boot Camp partition with no problem, even though it was living on an external HDD at the time. I then used OS X’s Boot Camp Assistant to make a new partition on my new hard drive a little bit larger than my old BC partition. (I tried making them the same size at first, but the new one always ended up being a little bit smaller and the restore operation would fail.) Once I had the new partition, Winclone restored my image file to it relatively quickly. When Winclone makes the image file you can compress it so that the image is only as large as the actual used space of the partition. This means if you had a 32gig install of XP on a 60gig partition, your image file backup will only be 32gig instead of 60gig. I think Winclone will be a great tool for doing periodic image backups of my XP install that can then be dumped onto my external archive drive. Before, I didn’t have any backup solution for my XP install beyond Dropbox. At any rate… if you find yourself needing to migrate a Boot Camp installation from one hard drive to another, or one Mac to another, give Winclone a serious look. So the Palm Pre came out today, and I’m mainly jealous of one feature on the handset… Synergy. This is the system that takes in contact information from several sources (Google, Facebook, etc.) and merges it all into one comprehensive address book. The iPhone doesn’t handle contact information quite as gracefully, but today I set out to give myself some illusion of the functionality by finding a way to easily import Facebook profile pictures into my Address Book. A quick Google search later I came across this DownloadSquad article pointing to the free application AddressBookSync. 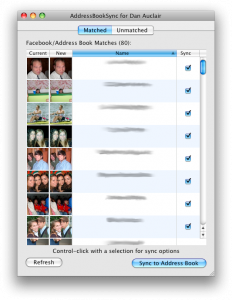 As DownloadSquad notes, there used to be an app called Facebook Sync that would import all information from Facebook contacts into the OS X Address Book, but it was pulled when Facebook cited Terms of Service violations. 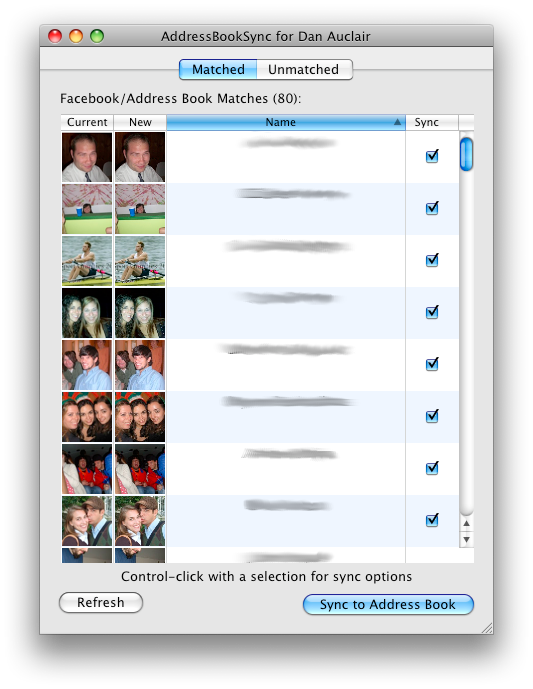 AddressBookSync doesn’t pull in much contact information, but it will import profile pictures, birthdays, and location from Facebook into matching names in your Address Book. I installed the app and ran it and quickly synced 71 photos, birthdays, and locations to my Address Book, and subsequently, to my iPhone. I really love having images that my contacts personally picked to represent themselves pop up when I get a phone call from them. I hope that some day this type of functionality will be an over the air sync option inside of the iPhone itself. Until then, AddressBookSync is a fast manual way to make sure that Palm Pre users aren’t having ALL the fun.